Requirement for this update is the installation of the update KB3085480, which Microsoft deployed on 9/8/15 (also via WSUS). I only can speculate, why Microsoft has not provided (yet) this update via WSUS. People, who wants to deal with the preview on the Next generation Sync client (NGSC) should install this update. Voraussetzung für dieses Update ist die Installation des Updates KB3085480, welches am 8.9.2015 (auch über WSUS ) von Microsoft veröffentlicht wurde. Das Update KB29758891 Update sorgt für einen reibungslosen Übergang von OneDrive for Business zum neuen Synchronisations-Client NGSC, der in diesen Tagen als öffentliche Beta zur Verfügung gestellt wird. Warum Microsoft dieses Update nicht über WSUS zur Verfügung gestellt hat, darüber kann man nur spekulieren. Wer sich mit der Preview des Next Generation Sync Client (NGSC) beschäftigen will, der sollte vorher dieses Update installieren. But if you have installed Office 2013 as a msi-Installation, you should install KB3085504. Also you should install this Update, id you are using Office Home und Student RT. Adds support for SSL 3.0, TLS 1.1, and TLS 1.2 so that documents can be securely and successfully opened from server endpoints. Office applications can’t merge OneDrive files if the applications get information about file mapping from OneDrive fails with a different reason other than "FILE_NOT_MAPPED." bei der letzten Update-Welle im September 2015 (immer am zweiten Dienstag eines Monats) hat sich nur indirekt etwas getan. 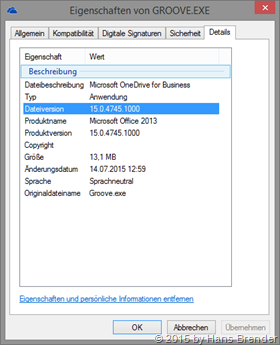 Die Synchronisations-Clients für OneDrive (SkyDrive.exe) und OneDrive for Business (Groove.exe) waren nicht betroffen. Wer aber auf dem Rechner Office 2013 als msi-Paket laufen hat, der sollte das Update KB3085504 installieren. Das gilt auch für Besitzer von Office Home und Student RT. Office Update Durch das Update wird SSL 3.0, TLS 1.1. und TLS 1.2 implementiert, so dass ein sicheres und vollständiges Öffnen von Dokumenten von Server-Endpunkten gewährleistet wird. Und wie immer der Hinweis, dass nur msi-Pakte von Office betroffen sind. Für Installationen von Office 2013 Klick-und-Los (C2R) wird Ihnen ein -Update-Optionen Element angezeigt. MSI-basierte Installationen enthalten kein Update-Optionen Element. Microsoft has released with his August-Updates 2 new Updates for OneDrive for Business. Due to my vacation days I’m a little late with this Blog post. One of the Updates resolved a problem with OneDrive for Business an the new OS Windows 10. The OneDrive for Business icon does not appear on the navigation pane of Windows Explorer on a Windows 10-based computer. Office 2013 applications may crash because of an internal optimization task. Because of the crash of the MSOSYNC.exe process that is part of being triggered by Windows Task Scheduler, Microsoft OneDrive for Business files sometimes cannot sync. When the sync response that receives from the server is PathNotFound, the client should try for a configurable time, and then throttle for a configurable duration of time before retrying. When you cannot upload or download files by using OneDrive for Business, you receive an inappropriate error message (for example, access denied). 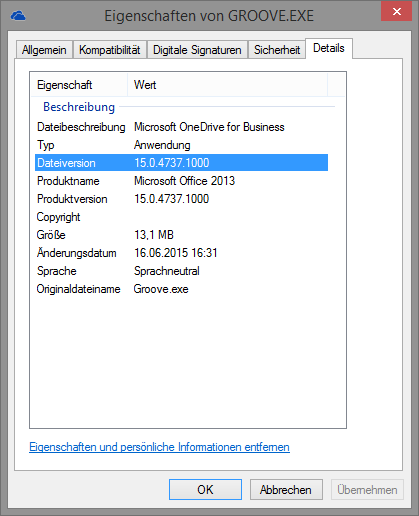 Mit dem August Update zu OneDrive for Business veröffentlichte 2 Updates, und das erste Update, welches ein Problem mit Windows 10 behebt. Und wie wir erkennen können, hat Microsoft wieder 8 Minor-Schritte vollzogen. ODFB Update Unter Windows 10 erscheint im Navigationsbereich des Windows Explorer das OneDrive for Business Symbol nicht. Office 2013 kann wegen eines internen Optimierung Tasks Programmabstürze auf. Aufgrund des Absturzes des MSOSYNC.exe-Prozesses, dessen Teil von Windows-Taskplaner ausgelöst wird, kann Microsoft OneDrive für geschäftlichen Dateien manchmal nicht synchronisieren. Bei der Synchronisierung kann es vorkommen, dass der Synchronisierungs-Prozess eine “PathNotFound” Meldung empfängt, und der Client sollte nach einer bestimmten Zeit einen nochmaligen Versuch durchführen, bevor der Prozess gedrosselt wird. Beim Uploaden oder Downloaden von Dateien mit OneDrive for Business kann es zu falschen Fehlermeldung kommen (z. B. Zugriff verweigert). Wie immer gelten diese Updates nur für MSI Installationen. Hier sollte die Version 15.0.4745.1001 oder höher stehen. You see, that are 10 minor steps forward. In rare situations, the Office synchronization task scheduler cannot catch and handle a specific error condition that causes an Office 2013 application to crash. When you try to synchronize a document library by using OneDrive for Business, the groove.exe process crashes. When you use an older version of OneDrive for Business, OneDrive for Business (groove.exe) may crash. When you use an Office 2013 application to open files from a OneDrive for Business folder or a SharePoint Server 2013 site, the Office 2013 application may crash if the device that stores files do not have sufficient disk space. When you cancel the download of a file that is in the pending download situation in OneDrive for Business, the file is not deleted as expected. When you use OneDrive or OneDrive for Business to synchronize a file, a conflict still appears if the conflict is resolved by a third-party application. 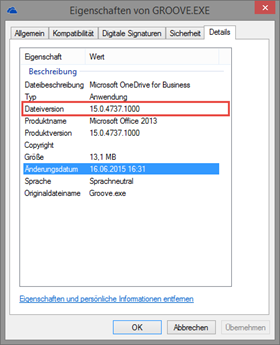 The WebPath property is not returned as expected for group folders of OneDrive. In this situation, file changes are in an error state, and cannot be uploaded. Introduces a registry key to control the mapping feature between a local file and a server file for Microsoft OneDrive and Microsoft OneDrive for Business. ODFB Update When you use OneDrive for Business to synchronize a folder, you may experience high CPU usage and network consumption. This issue occurs after you rename a folder to the same name but cased differently.